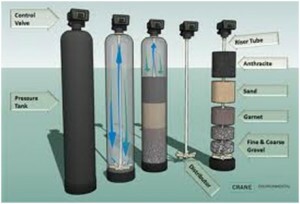 It is very obvious that the right choice of medium – the little beads inside a filtration tank – is crucial. This is where the magic happens. Some media require low flow-rates, others require higher flow rates. Specific weight, dry and wet conditions, removal capacities, regeneration aspects, bulk density and much more are factors that need to be looked at. We custom design systems and take all these considerations into account. Overlooking crucial aspects, all too often leads to system failures, fouled media and can actually lead to adverse affects, meaning that now the system could potentially even worsen the water quality. We refrain from taking a generic approach to finding a working solution. The past has shown there is no such thing as “I live in a certain area, hence I need…” or “My neighbour has “xyz” in his water, hence I need the same”. No two wells are exactly identical; even on municipal water supplies, large differences and variations can be found. And consequently the right solution for your specific needs should be customized too. Talking about media and filtration: There is carbon available for about $200 per cubic foot and there is carbon available – definitely not the same type though – for $2200 a bag. Cationic resins and anionic resins both can show totally different characteristics within their respective fields. What type of regeneration is best and most effective for which medium? In other words: it is necessary to know the limitations of each medium. How much of an existing impurity can this medium deal with? How much flow rate is required? How much free-board is a must inside the tank? Which other contaminant in the water can possibly interfere with the medium’s efficiency? Focusing on one or just a few parameters or contaminants only and neglecting potential counteracting circumstances, just does not cut it! You can have the best and most expensive arsenic removal medium available on the market, the best type of carbon, the most efficient iron removal medium out there, and so on, but if certain conflicting parameters are not tested for and dealt with beforehand, your filtration medium will not just be useless prematurely but leave you with unsatisfactory and potentially even harmful water quality results.